At reunions although some of us sport an old tie somehow kept from school days, many like to wear the popular Soham Grammarians' tie. 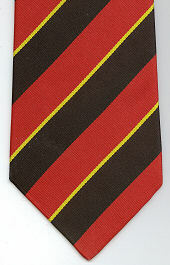 We now have a stock of a good value polyester version of the standard Soham Grammarians tie in the red/black/gold school stripes with no emblems. These are available from John Dimmock, 11 Toyse Lane, Burwell, Cambridgeshire CB25 0DF by post (inc p&p) at £10 (UK): overseas buyers please contact John first so that postage can be checked. Cheques should be made to Chris Bent and in British Pounds if possible. If in another currency, please increase the amount to take account of bank charges and exchange rate so that we are not out of pocket.